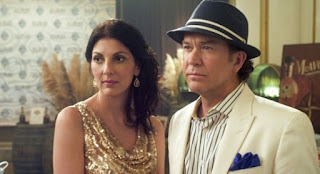 Episode Review: LEVERAGE, "The Lonely Hearts Job"
After a string of episodes that were slightly different than the norm, Leverage went back to basics with "The Lonely Hearts Job," and while it wasn't ground-breaking, it was still fun to watch. A rich businessman by the name of Walt Whitman Wellesley IV walked into McRory's looking for Nate because his wife, Lacy, was missing for four days, and he wanted the Leverage Crew's help finding her. Nate decided to help Wellesley in exchange for a possible favor down the line. As it turned out, the client's wife was a grifter who was a part of a sweeheart scam. The Crew infiltrated a bachelor auction in the Hamptons to see if they could smoke her out. At the auction, it became clear that the women bidding on the wealthy men were also grifters and were a part of a team led by a woman named Meredith. Nate decided that the way to figure out her connection to Lacy was to pose as a competing con-man who wanted to partner up. In order to get a idea of what Nate was capable of, Meredith challenged him to pick up Sophie who was acting the part of a duchess. Unfortunately for Nate, Meredith's other partner was putting the moves on her so he had some competition. While Nate jousted for Sophie's affection, the rest of the Crew tried to figure out what happened to Lacy. After breaking into Meredith's office, they learned that Lacy was really a woman named Christine who left her husband and went into hiding after Meredith threatened to kill him if she didn't. Since Lacy/Christine fell in love with a mark, Meredith could no longer trust her and needed to protect her scam. Once the Crew found out what had happened to Lacy, they showed up in the nick of time to help out Nate who was being held at gunpoint by Meredith and her partner San Guillermo (the guy wooing Sophie). When it was all said and done, Nate was able to get a list of all of Meredith's marks (with the help of Parker and Hardison) and exposed her for the con that she was. "Lonely Hearts" didn't involve any big picture storytelling or use any gimmicks that could have gotten in the way. It was a straighforward, "The Crew takes on other cons" episode which tend to be the most entertaining of the bunch. While I cannot say that this one was as good as "The Two Live Crew Job," it still had its moments. For example, I'm usually not a fan of the Nate and Sophie relationship, but I was glad that the writers finally moved the couple along by having him show more of his true feelings. I'm not rooting for them any more or less after watching the episode, but I did enjoy the sweet moments between the two of them. What I also liked about this episode was the fact that it was strong Eliot episode even though he was relegated to the sidelines for most of it. The scenes of him protecting Nate, arguing with Hardison, and interacting with Parker were classic Eliot moments that made things feel lighter and more enjoyable. That scene where he sent Parker and Sophie flowers for his boys was also a nice touch that rounded out his character even more. The only bit of "Lonely Hearts" that I didn't like was the final scene between Nate and Latimer. Now, I know that I've been clamoring for more serialized storytelling from this show, but adding a throw away scene at the end of a stand alone episode that's only there to remind us that there's supposed to be a bigger story going on always feels like a cheat. I'm intrigued to see what will come from that exchange, but I just wish we had gotten more of a build up over the last couple of weeks. I love it that Eliot was upset that Hardison made it so his fake bachelor persona was from Austin. No Sooner would be OK with that one. Emma Caulfield has aged well. We need more Buffy alums on our TV screens. Parker + girl fight = Hilarity. Move over Troy and Abed because Hardison and Eliot are the best bromance on television. Their tiff about their bet was genius. Eliot getting his chef on will always be welcomed. Ditto for Parker getting to drive. Sophie: "You're one to laugh. You don't even bother to learn their names. They're either waitress, nurse, or stewardess." Eliot: "First of all, it's flight attendant alright. They don't like being called stewardesses. And second, I know their names." Parker: "Are you guys having a three-way? "Let's go steal a sweetheart. No, a widow? Spider? Spider." Parker: "But these jewels, they're just asking to be taken." "Page 189, rule number 7 of the bro handbook. The bet is off..."
Much like the rest of Season 4, "The Lonely Hearts Job" wasn't revolutionary television, but it was entertaining enough. I know I've probably written this before, but I'll take decent character moments like the ones during this episode any day of the week, so I'm ultimately a happy camper. Now, let's see if Leverage can successfully start connecting all of the dots before the season finale.